The Paperback Sessions is the brain-child of journalist Georgia Curry. And being a deft hand at the quill and ink, she’s made my deadline-averse job so much easier by providing pretty much all of the written copy to my questions below. That makes her something of a goddess in my eyes. Georgia: I actually didn’t want to be the public face of this thing. I’m a fairly private person, but I’ve discovered that if you want to promote something then you have to put yourself out there. I’m an ex-journalist, having worked as a reporter for The Canberra Times for nine years. 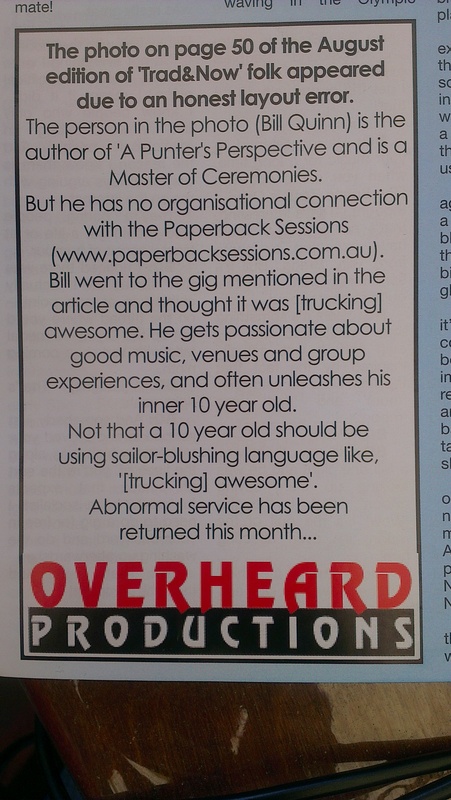 During that time I edited the then Times Out (now Fly) entertainment lift-out and got a taste for the music scene. I also dabbled in public affairs in the public service – but then saw the light, and quit. More recently I volunteered to promote the Corinbank Music and Arts Festival, as well as the National Folk Festival, where I got the urge to promote a music event of my own. And how did the Paperback Sessions come about? 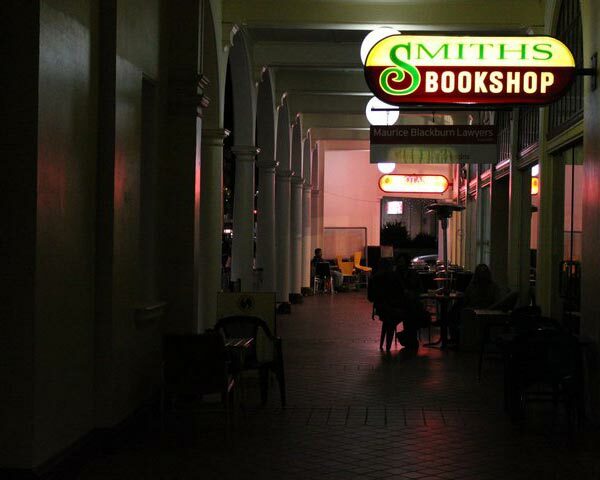 I regularly visit Smiths Alternative Bookstore, usually with a laptop, to write and be inspired. And earlier this year when I noticed their new wine bar, it was like all of the planets aligned – I could visualise this brilliant intimate music venue and see its great potential. There was absolutely no doubt in my mind that it wouldn’t work. All of the hard work in establishing a new venue had already been done: it’s much-loved by the community (an institution in Canberra since 1976), it has bucket-loads of ambiance with its alternative vibe, and it’s already well-patronised by locals. What’s worked so far for you? What are the positives? I guess that fact that it was embraced so quickly and warmly by Canberrans. I was a relative nobody, with no industry contacts or reputation, and yet my first show with Brendan Gallagher was a sell-out. After three sold-out shows (Brendan Gallagher, Abby Dobson, Heath Cullen) I’m absolutely wrapped. I always had an inkling that there was a demand for these kinds of small shows. It’s how music should be – live and intimate. I’ll keep doing it for as long as Smiths Alternative Bookstore lets me. What’s proved challenging? What’s given you any headaches? The challenging part is getting people to buy pre-sale tickets. For a promoter it’s great peace of mind to sell a heap of tickets upfront. However, Canberrans are renowned for being fashionably late. they leave things to the last minute. So yeah, that’s been pretty stressful, the waiting and fretting. But hey, when they all come flooding in through the doors at the eleventh hour, it’s brilliant. The highlight is definitely the response from the artists. Not only does the audience love to play in a quirky little bookstore, so do the musos! I’ve been inundated by artists (ARIA-winners, nationally-renowned performers from interstate) who want to play here. These are artists who I haven’t contacted or invited. They’ve heard about the Paperback Sessions through word of mouth and that great time-waster, Facebook. What’s it like holding the gigs in a bookstore versus a more traditional venue? I guess the set-up is a hassle, converting a bookstore into a live music venue with seating. I lug in 50 plastic outdoor furniture-type chairs (borrowed from Belconnen Bowls Club and the Revolve tip) for every gig. I also bring in four couches from my own lounge room (cat hair and all) so it’s pretty exhausting work. What’s coming up? What does the future hold? One thing that I’ve learned in the publicity game is to not let all of your big news out at once. I’m focusing on one gig at a time, to give each artist fair publicity and a fair grab of the ticket sales. All is revealed in good time on my Facebook page and website. Let’s just say that we’re no longer doing monthly gigs. I’m chockas booked up from September till the end of the year. And geez I hope everyone comes with. As a punter, I’ve attended just the one of these gigs, the Heath Cullen gig supported by Alice Cottee. My ensuring memories are the great press of people not wanting either performer to stop, and the respectful listening during the numbers erupting into enthusiastic applause.